Second quarter rent and occupancy trends continued to show slowing growth in the national apartment market, although solid economic factors kept the market humming. According to RealPage, rents grew at a year-over-year rate of 2.3 percent. 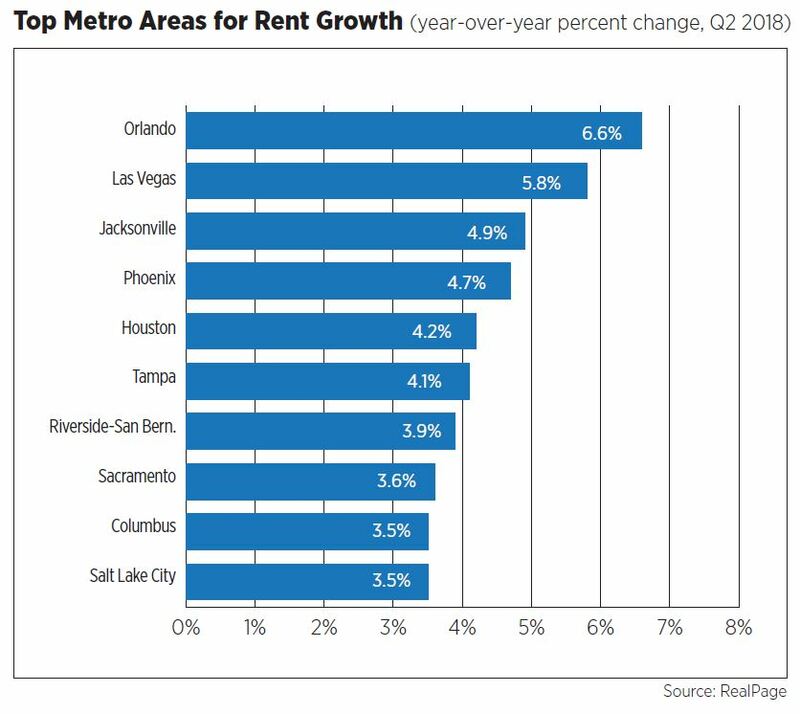 The secondary Sunbelt markets of Orlando and Las Vegas continued to dominate with the highest rent growth rates at 6.6 percent and 5.8 percent, respectively. Alternatively, the markets that posted strong rent growth earlier in the cycle, including Austin, Seattle and Dallas, fell to the bottom of the list with growth rates for each measuring less than 1 percent. At 4.8 percent as of Q2 2018, the national vacancy rate increased by 50 basis points from the year prior, per REIS. Sixty-four of the 79 markets tracked by REIS saw vacancy rates increase during the past year, with the Buffalo, N.Y.; New York City; and Charleston, S.C., metro areas each seeing increases of 1.6 percent. This is likely the result of the continuing addition of new supply. Only 13 of the 79 markets saw decreases in vacancy, led by the Birmingham, Houston and Norfolk/Hampton Roads metro areas. The Census reported that the seasonally adjusted annual rate for multifamily construction starts in May was 404,000 units, a 27.4 percent jump from the year prior. Deliveries totaled 389,000 units, an 8.1 percent increase from the same time last year. Multifamily permits also grew, increasing to 424,000 units from 386,000 units the previous year. Despite the increase in new supply, strong job growth and the constrained for-sale market have continued to support demand. Reflecting steady investor confidence after some unease earlier in the year from rising interest rates, closed transactions for apartment property sales totaled $158 billion for the 12 months leading up to May, according to Real Capital Analytics, up 6.4 percent from the year prior. The average price per unit increased by 5 percent to $148,927, and just over 1 million units changed ownership. 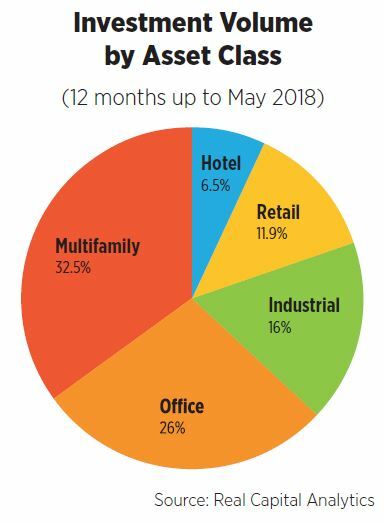 Rental housing continued to be investors’ favorite real estate asset class, with apartments snagging 32.5 percent of all transaction dollars in the 12 months leading up to May. This was ahead of office (26 percent), industrial (16 percent), retail (11.9 percent) and hotel (6.5 percent) classes. Coastal gateway markets continued to rank highest by total value of projects started in Q1 2018. Greater New York City was first with $4.7 billion worth of projects started, but the region’s figure has steadily declined after peaking in the second quarter of 2016. This was followed by the Miami, San Francisco, Seattle and Boston regions. The top developer ranked by value of projects was the CIM Group, with projects worth just more than $1.2 billion. Greystar, Mill Creek Residential, LIVWRK and Alliance Residential rounded out the top five. 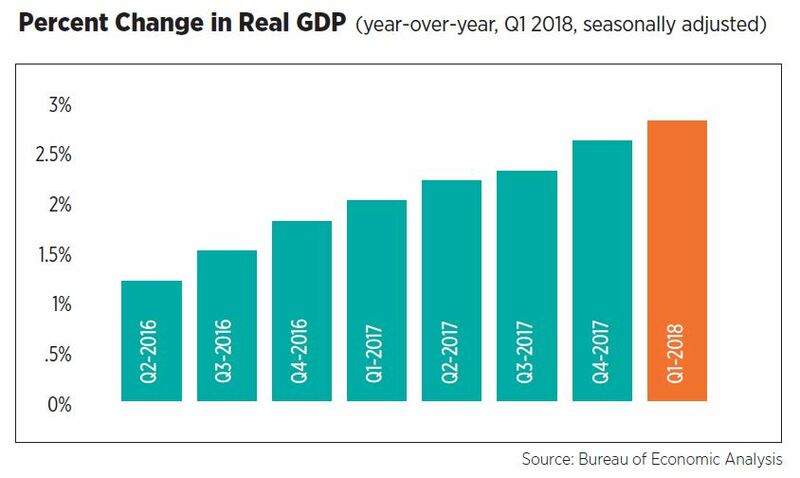 The U.S. economy continued to perform well into Q2 2018. First quarter gross domestic product (GDP) passed the 2.5 percent mark for the second consecutive quarter. At 2.8 percent year-over-year, it was the highest level of growth in nearly three years, driven mainly by nonresidential fixed investment, government and consumer spending and exports. As expected, the Federal Open Market Committee raised the federal funds rate target range a quarter-point to 1.75 - 2 percent at its June meeting. The Fed also revised its 2018 forecast for GDP and inflation upward and lowered the unemployment rate projection from 3.8 percent to 3.6 percent. Despite concerns about trade wars and employment pressures, healthy job gains, business and consumer spending and stronger GDP growth continue to buoy the U.S. economy. Investors are still comfortable with consumers’ preferences for renting and favor apartments as an asset class even as rent growth slows. The sustained introduction of new rental housing supply is being offset by climbing interest rates and low for-sale inventory, two trends that are likely to have staying power, dampening the housing market in favor of the apartment sector.